Across Town or Cross Country: Saving Your Horse from Transport Stress! Motion sickness and travel stress affects many people, but did you know that horses can get stressed when traveling, too? Most of the time, owners can lessen the stress and sickness for their horses by simply being more careful when loading the trailer and while driving. It is safe and simple to transport horses, if you consider all the factors that could cause your animal undue stress. Take steps to reduce, or even remove them. Doing so will not only protect your precious cargo, it will give you the peace of mind to keep your focus on the road. If you’re taking your horse horse across town or across the nation, the following recommendations can make the ride much easier for everyone. Horses bow their heads often. They’re not depressed – they do this to alleviate respiratory stress and for mucus-draining purposes. Traveling in a straightaway trailer with limited space stresses horses and their ability to breathe. They may even compete with the other horses for extra space in the carriage. If trailer room is limited, leave your horses untied, or give them enough leeway to move around a bit and bow their heads for better breathing and comfort. When possible, ship horses with their friends, meaning other horses they’re familiar with. This lowers the risk of attracting disease from other animals. Also, like humans, horses feel comfortable around those they know. They feel less stress when coupled with recognizable horse mates. Consider investing in a 2-horse gooseneck trailer, which provides a lot of space, yet allows for plenty of comforting companionship. In tight spaces, pathogens from manure have a far greater influence on a horse’s respiratory system, especially if the animal is already feeling stressed from the trip. Always clean your horse trailer thoroughly between treks. For long trips, stop intermittently to clean manure from the trailer, and wash away all traces of urine and dried feces. Loading is extremely stressful for horses, and a time when injury is most likely to occur. Teach your horse the loading procedure by walking them through it until they are comfortable with the process. Don’t overwork your horse by over-practicing, though. Just get them familiar with loading, and give them a refresher course once or twice a week. If your horse is especially difficult or reluctant to learn, hire an experienced and patient trainer. If there has been a longer gap in trips, take your horse for a practice run by making a short road trip. Unless you’re traveling in the colder northern territory, it’s not likely your horse will get too cold. 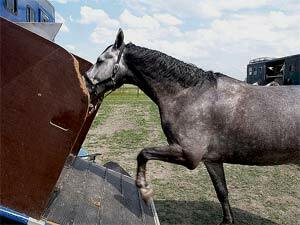 However, horses become stressed and sick due to poor ventilation and rising temperatures inside the trailer. Leave the trailer windows or vents open. Check for drafts coming from the back of the trailer that could blow exhaust fumes into the small area. Maintain great air quality and make accommodations to keep the inner cabin from becoming too hot or cold for your animals. Travel taxes horses, both mentally and physically. If you’re planning on using your horse for an athletic or farm-related event after the journey, leave early to give the animal a few days, even as much as up to one week, to rest and get its strength back. For after-trip conditioning, give your horse about a week to recover and get back to normal health after a long drive. Timing and money may be important factors to consider, but the best way to care for your horses is to adopt a slow and steady driving routine, rather than an erratic and time-sensitive trip full of stress. In order to understand hauling horses better, have someone drive the trailer while you sit in the back, mocking the ride of the horses. Some horse owners even secure a half-full glass of water to the top of the dashboard, noting that any water splashing outside the glass is the direct result of erratic and potentially unsafe driving. Dan Kelly has been working with horses since he volunteered at a neighbor’s ranch as a teenager. With a heart for their grace and strength, he often writes about horse training and care on equestrian blogs and training sites. Learn more about horses. See the World of Horses and Ponies with all types of horse breeds from light horses and ponies, to draft horses! Hope this helps and thank!